The Fagus Factory, an operational shoe last factory, is an important example of early modern architecture. The construction of the architectural complex started in 1911. It was built by the architect Walter Gropius. Light was required for work purposes: this lead to an almost entirely glazed building, via the innovative use of "curtain walls" (vast glass panels). It was a major break with the existing architectural and decorative values of the time. The site contains 10 buildings, including a sawmill. Although constructed with different systems, all of the buildings on the site give a common image and appear as a unified whole. All buildings have a base of about 40cm of black brick and the rest is built of yellow bricks. Two weeks after its WH designation, this still proved to be a pretty low-key site to visit. Alfeld an der Leine is a town somewhat hidden in the land close to the former GDR border, some 50km from the main North-South Autobahn. The Fagus Works is signposted from the town entrance, and indeed at first sight just looks like a factory. A very clean one that is – they develop wooden shoelasts here. I visited on a Saturday, when no production was going on. By car you enter the complex via the main factory gate. The gate house was also designed by Gropius in the overall style of the complex. I told the guard that I wanted to visit the exhibition, and he sent me on to a grey building at the back of the complex. This was a former storehouse, which was turned into an exhibition building. There were about 15 other visitors around. One of the caretakers noticed the Dutch license plates on my car and called out - “all the way from Holland!” A foreign visitor clearly still is a rarity here. After paying the small entrance fee (3 EUR) I made my way through the four levels of exhibitions. The lower levels are mostly dedicated to the building’s history and architecture, while the upper levels focus on shoemaking. I really liked the historical photos of the factory – while it still was under construction, and the photos by Albert Renger-Patzsch that made this work of modern architecture famous around the world. All the time I was a little anxious – the exhibition is quite well done, but what I had came for was the architecture. Unfortunately the general public is not allowed to enter the main buildings. You can freely walk around the complex and take pictures, but that’s about it. I think a visit to the site would greatly improve with a guided tour around the buildings. We arrived at the Fagus factory on a Saturday with the intention to participate in one of the guided tours which take place on Saturdays and Sundays. However, because there was an event scheduled on Sunday there was no tour on Saturday (since they were already setting up things for the event the next day). Therefore, we had to take a tour with an audio/video guide. But we were lucky: the workers preparing the event didn't mind that we walked around in the factory so we got to see the same as during a guided tour (and maybe even more?). Next to the audio guide tour, we also bought the 3-in-1 ticket (UNESCO visitor centre, Fagus-Gropius-exhibition and Gallery). The visitor centre does not add much to the info you get from the audio guide, but you can play with a media wall with information about all WHS (surprisingly addictive!). The Fagus-Gropius-exhibition in the former warehouse provides five floors of background info about Fagus, shoes in general and even wood in general. While very well done and certainly interesting, we got the impression that there is too much space to fill - the upper floors become very high level. The Gallery is located in the former warehouse basements and is an art exhibition (can be skipped in our opinion). 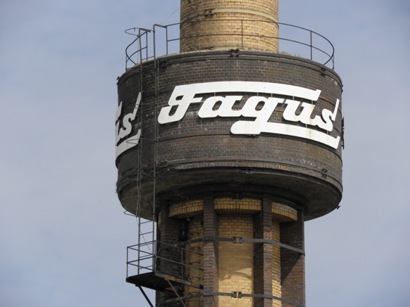 Since we took the 'full package' (audio tour plus 3-in-1 ticket), we have spent about 2.5 hours at the Fagus factory, ending our visit in the Fagus-Gropius Café in the factory's former power plant. We would certainly recommend the audio guide (or guided tour if available) while the exhibition is nice if you have somewhat more time. To appreciate the significant architectural details, it’s important to see the building from the outside and the inside. Even though the factory is operational, there are tours through all areas including past the production lines. There is also an excellent museum over several floors of the old warehouse that tells the story of the building and the business. The tour that I take is led by one of the workers here – like most of them are. This means that not only do you get a great explanation of the building and its features, there’s also the opportunity to get a fascinating insight into the life of the workers and how it has changed over the past century. 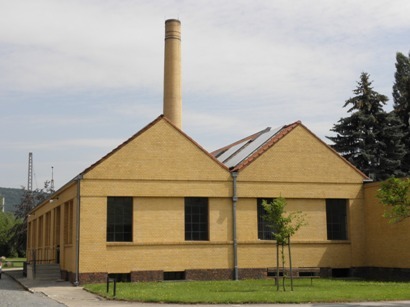 The Fagus Factory is just a short ten minute walk from Alfeld train station and, in fact, arriving by train from the north gives an appropriate preview to the site. The factory is built along the railway line for the easy transportation of goods and the architects placed more emphasis on the trackside part of the building because they considered it would be seen by more people. First things first, you can visit the factory from the inside. They offer guided tours run by retired employees each weekend and the tours come highly recommended (Sat 12:00h, Sun 10:30h). The level of access you get to a still fully operated plant is surprising. Unfortunately, the tours seem to be in German only. 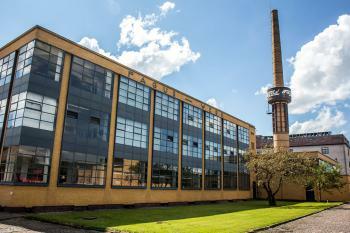 For Gropius the Fagus Factory was his big breakthrough. He was 27 and did not have a big name yet. Through familiar connections he heard of the plant being built in Alfeld and wrote Carl Benscheidt, the founder of Fagus. Supposedly, Gropius' must have been pretty convinced of himself (loads of swagger in the letter). Lucky for him, Carl Benscheidt appreciated this mindset, recognized his talents and gave him the job. 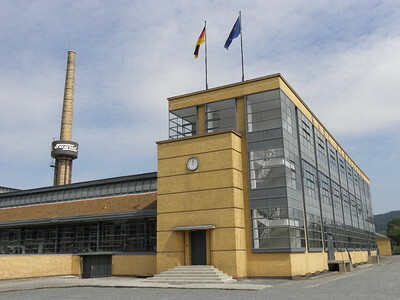 Gropius took over from Eduard Werner who had done the original plans for the plant. The result is a magnificent Bauhaus building, eight years before there was actually a Bauhaus (1911 vs 1919). 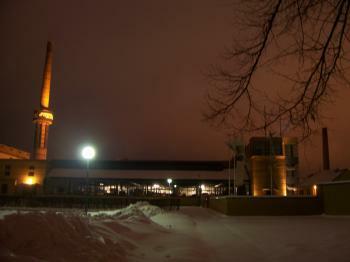 Apart from the architectural perspective, it is worthwhile to look at Fagus as an industrial heritage site. It's not a mine, not a coal or iron plant, but a shoe last plant, pretty unique in and of itself. Originally shoe lasts were made from beech, latin fagus, which is also where the company got its name. I had little knowledge on how shoes were produced so going to a shoe last plant was quite informative. 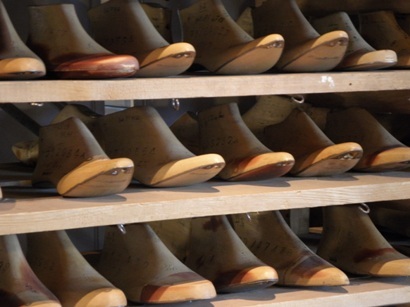 The founder of Fagus, Carl Benscheidt, got his big break in the 19th century when he sold shoes specifically tailored for the left and right foot each instead of a generic shoe form to be used on both feet. Benscheidt worked for 30 years for a shoe last company in Alfeld (Behrens) and left to found his own shoe last factory when the heirs took over. Indeed, you can see his original employer just across the railroad tracks. The company Benscheidt founded (Fagus) is still in existence 100 years later and owned by his family. The company (Behrens) he left went broke 40 years ago. Fagus still manufactures shoe lasts, but in a sign of the changing times, the German plant primarily does the design of the shoe lasts while the manufacturing takes place all across the globe. On top, shoe lasts are only one business area of the company. It expanded into engineering and electronics in areas related to their manufacturing processes (measurements, safety). In this way, Fagus is a very nice example of the famous German Mittelstand: innovative, globally competitive, evolving, family owned. The factory has parking and is next to the train station of Alfeld. The good railroad connection was a prerequisite for the shoe last production. I would recommend visiting on a weekend when the plant is closed. There is a small cafe, a visitor center and a museum on site. The site has the GREATEST world heritage exhibition I have EVER seen. In the new visitor center they have a 5m x 1.5m touch screen that shows world heritage sites across the globe with pictures. It's really immersive and loads of fun. The site is part of the Harz hotspot. Hildesheim, Goslar and Corvey are nearby. We continued by car to Corvey. The whole region (Harz, Weserbergland) is really nice, old towns dotted in hills, monasteries, palaces ... On the road from Alfeld to Corvey we passed several sites of note that we wanted to explore. I visited this WHS in November 2014. I confess I'm not a fan of industrial heritage sites in general and so I wasn't too keen to visit this WHS. Yet I was pleasantly surprised with the way the visit is structured and even though you're not allowed inside the shoe last plant itself, the curtain wall windows easily allow any visitor to see the employees at work producing shoe lasts. In fact I'd recommend visiting on weekdays if possible to avoid seeing an empty factory. I also bought the new Fagus Factory 60c stamp and an interesting addition to my WHS library "Deutschlands Welterbe: Eine Reise zu allen UNESCO-Stätten" from the gift shop. All in all I think the Fagus Factory is a worthwhile stop on your way to Hildesheim or Corvey Abbey. Two years after my first attempt I finally managed to get the right train and finally pay this site a proper visit, and I must admit I loved it. In fairness it was always going to appeal to me as it is an iconic piece of modern architecture. 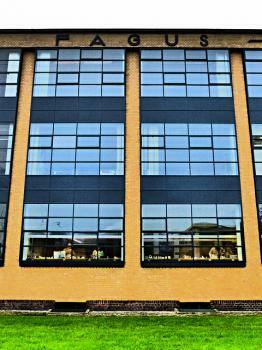 The most important part architecturally is the glass curtain walls which were the first of their. Unfortunately these can mostly only be seen from the outside as the museum is in the earliest part of the factory. Whilst this was a little disappointing, the display in the museum was certainly very dedicated in putting forward the various aspects of its history. Whole floors were dedicated to its history, workers, architecture, materials, fashion and even on World Heritage sites; I was suitably impressed. The highlight for me was the top floor, having reclined back into the elegant wooden loungers I suddenly sat bolt upright as it abruptly dawned on me that they were angled to give a perfect view of the iconic ‘Fagus’ advertising wrapped around the chimney stack, wonderful. As with several other visits to the less well known WHS in Germany, the staff were exceedingly friendly and helpful. The grounds keeper drove me around the site and made me feel welcome, even if my German meant I didn’t necessarily understand everything he was saying. After I had visited the museum I helped him get in contact with a relative in London, and in return I got to see some of the bits of the factory that are normally not as accessible to visitors. He even drove me back to the station to make sure I made my train. Whilst a little more could be done to help explore the factory’s iconic architecture I felt the site did a good job at highlighting the various other aspects of the factory’s history. I really enjoyed my revisit to this site and it has provided one of the stranger souvenirs from a WHS as the shoe last sitting on my desk attests. The Fargus Werks is a really important piece of modern architecture that has influence so many other aspects of the built environment around the world, it may not appeal to everyone but I really loved my visit here. 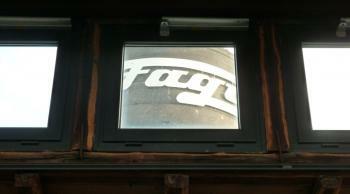 My visit of the Fagus factory in Alfeld was the last step of a 3-week-tour through Germany in summer 2009. I ticked off 11 WHS (e.g. Weimar, Dessau, Berlin, Quedlinburg, Dessau), now Fagus is the twelfth and clearly one of my favourites. 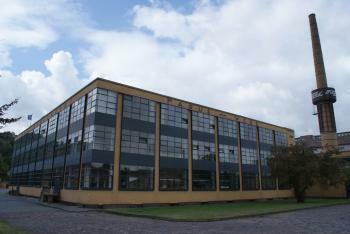 The factory was constructed in 1911 by Walter Gropius, who later founded the Bauhaus school. With its characteristic glass curtain walls, the steel structure and the cubic form the building was innovative and trend-setting. Hundert years ago, industrial facilities usually were dark, clumsy and windowless. Fagus appears bright and clear. 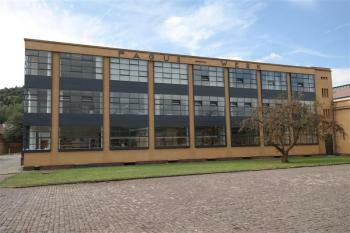 Fagus factory influenced modern architecture, e.g. the transparent glass fronts of sykscrapers. The building was constructed as a manufactory for shoe lasts and is still owned by the offsprings of the company's founder. It is not possible to visit the interior (maybe by special appointment), because shoe lasts were still produced in the factory. Visitors have access to the territory of the factory, so that you can view the buidling from all sides. There is also an exibition on the history of the building, the company and the shoe fabrication in a former storehouse. Alfeld is located 50 km south of Hannover and 25 km south of Hildsheim (another WHS), the factory is close to the railway station. I completely agree with the opinion of Ian Cade that Germany do well when nominating their modern heritage to the World Heritage list. And there is another modern site on the german T list: Chilehaus, Kontorhaus district and Speicherstadt in Hamburg. Chilehaus is a office building from the 1920s. It probably will be nominated in 2013 or 2014. ‘Perhaps it is the ones that get away that prove the most interesting’ I thought to myself as my train trundled passed this magnificent 100 year old modernist shoe last factory, I think that was just a feeble attempt to console myself for the error that meant I missed a proper visit to this site. I had been looking forward to visiting this site in Alfeld (30 minutes south of Hannover) for a little while; alas I contrived to miss it by catching the wrong train a few hours earlier. As such I was only able to admire the impressive glass curtain walls and iconic chimney stack from behind the locked gates leading into the compound. This is one to add to ‘almost visited sites’ as I was not able to get up close and have a closer look. Oh well, gives me a good reason to return I suppose! The factory was the work of Walter Gropius and Adolf Meyer a few years before they took up prominent roles at the Bauhaus. Its pioneering use of glass walls set out design features that are still very influential; although they are now much refined as their implementation here at the Faguswerks and a decade later at the Bauhaus building was beset by problems of speedy corrosion and poor heat insulation. Even with these problems the building is still regarded as an early masterpiece in international modernism. Germany has done very well in getting its modernist heritage onto the world heritage list. This is something that is often ignored by other countries, but it perhaps reflects on how Germany wants to portray itself to the outside world, especially providing a balance to its more infamous 20th century legacies. For me I think this is great; I am a big fan of modernist architecture and would very much welcome the addition of the Farguswerks to the World Heritage list. I am not sure if everyone would view this in the same way, this could well be the fifth modernist structure Germany has inscribed [Bauhaus, Zolverein & Berlin Housing-estates, with the Le Corbusier buildings in Stuttgart surely to arrive soon, please! ], perhaps some would view this as overkill. But for me this is something to really be encouraged and it will hopefully make other countries look at their 20th & 21st century heritage in a more favourable light. Designed by Walter Gropius: The factory was designed by Walter Gropius and Adolf Meyer.